Srinagar: A 17-year-old village girl and an Indian soldier were killed after Indian and Pakistani troops traded small arms and mortar fire along the Line of Control in Kashmir on Saturday. Both sides have accused each other of initiating the firing. In Islamabad, a statement issued by Inter Services Public Relations (ISRP) office alleged it was the Indian troops who resorted to firing first. “The unprovoked firing took place in the Pando sector at the LoC near Muzaffarabad. 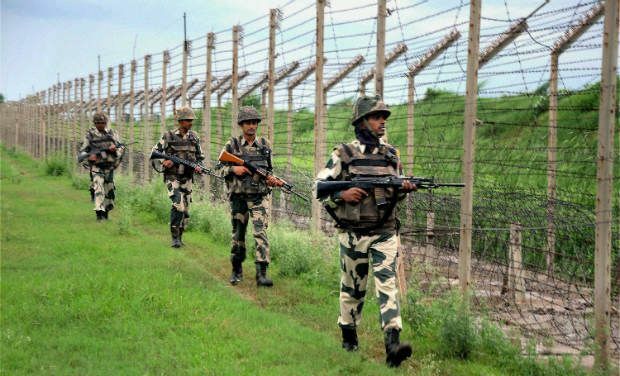 Pakistani troops responded befittingly to Indian firing, and no casualty or loss was reported (on their side)”, it said adding the intermittent exchange of fire continued between the two sides. Reports from Kamalkote and adjoining areas of Uri, about 120-km northwest of Srinagar, said that one of the mortar shells fired from across the border landed in the house of one Ghulam Bhatti injuring his daughter Gulshana. She was rushed to a government hospital in Uri town where doctors declared her brought dead. Hospital sources said that the girl had received multiple injuries. The commanding officer of India’s 19th Division, Anil Chauhan, was quoted by a local news portal ‘Kashmir Dispatch’ as saying, “There was no infiltration attempt and the LoC was peaceful, but Pakistan troops violated the ceasefire.” Local news agency GNS reported that the facing troops exchanged heavy small arms and mortar fire along the LoC near (India's) Nanak post in Kamalkote and Tika Post in Churanda areas. Soldiers of 11 Madras and 3/4 GR who are guarding their posts returned the Pakistani fire in which one of the soldiers of 11 Madras was killed. Last month, more than thirty civilians were killed on the two sides of India-Pakistan border, mainly International Border (called working boundary by Islamabad) in Jammu-Sialkot area, in a spate of attacks and ceasefire violations which also triggered exodus of civilian population from the border belt.